Players who are fans of Fruit Fall, Fruit Fest and Ultra Hot Deluxe are going to love this retro, fruity slot. 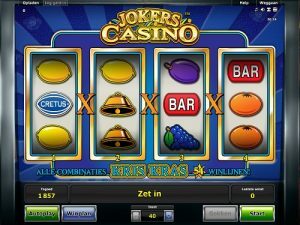 This slot feels like it’s just come out of a 1960s games arcade and is full of old-school symbols, such as fruits, like the watermelon, cherries, grapes, oranges, lemons and plums; golden bells; red sevens and the joker himself! There are 4 reels and winning combinations ‘criss-cross’ which means there are 54 win lines in total! The aim of the game is to spin 3 matching symbols across a win line – and, as long as they fall on consecutive reels from right to left, or left to right, they’ll give you a nice payout! Jokers Casino is a fantastic slot for well-seasoned slots players who are looking for something basic, to invoke the feelings of old-school arcade fun. It’s also great for anyone new to the world of online casino as it’s a relatively simple slot to understand, yet really fun to play. Your bet amount is always clearly displayed for you at the bottom of the screen, in the middle, and your winnings are on the right, with your balance on the left. You can change your bet amount at any time, by using the plus and minus symbols to either side of it and then you can consult the paytable to see how much each winning combination of symbols will pay out according to your bet amount. The paytable also explains the rules of the game and gives more information about the different bonuses and symbols. The Joker, along with the red seven, is the highest-paying symbol as a winning combination of three of either symbol will give a payout x5 your bet, but the joker is extra special. He substitutes for all other symbols so whenever you see him fall on the reels, you’ll know he’ll increase your chances of a win! There is also another special symbol, which is the ‘Cretus’ logo and whenever you spin three of these on consecutive reels, in a winning payline, you’ll be awarded a mystery bonus – the amount of which can be anything between 0.5 and 5x your bet! Just like with most other NovomaticCasino.co.uk games, you can play for fun until you think you’re ready to start winning real money! When you feel as though you’ve got the hang of the game, and you’re happy with your bet, you can use the game’s ‘autoplay’ function, which enables the reels to spin without you having to lift a finger. Jokers Casino also has the double-or-nothing gamble feature with which you can use to turn even the tiniest of wins into something noteworthy! Each time you get a win, just click on ‘gamble’ and guess what you think the colour of the next card will be. If you guess right, you’ll double your win! Keep going, keep guessing right and you’ll keep on doubling the total! Remember, though, if you guess incorrectly, you’ll lose the win and be back at the reels! We know if you love Jokers Casino that you’ll love our other slots and video slots. Not only that, but we have some excellent table games and live dealer games which we’re certain you’ll absolutely adore! Our table games include: Baccarat and Sic Bo, and our live dealer games are so authentic and advanced that, when you play, you’ll feel as though you’re playing in the middle of a real-life, bustling casino! Take a look for yourself and choose between: Live Baccarat, Live Blackjack, Live Roulette and Live Poker. You won’t live to regret it, in fact, you’ll wonder why you never tried them sooner!